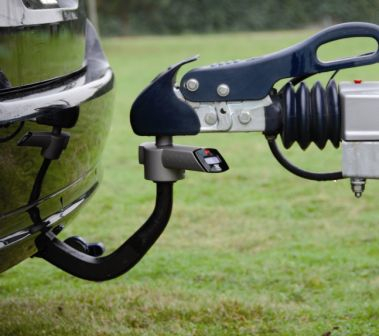 Reich's device provides a quick, easy and accurate way to measure the vitally important weight of the hitch on the towball for caravans and trailers. The Reich TLC Towbar Load Control combines an elegant design with maximum accuracy. Measurement is carried out with the device located between the towing hitch and the towball; the device uses load cell technology for maximum accuracy and measurement take place at consistent height with software adjustment to calculate the actual towing height. Conventional methods use scales or nose wheel gauges based on springs. These can be inaccurate method and are cumbersome and heavy - while a broken housing carries risks from powerful springs, Reich points out. The TLC is lightweight and compact and easy to take along during your journey. Digital read out in steps of 1 kg. Weighing method: the TLC is placed in the hitch socket and the hitch and TLC are then positioned on top of the towball. Press the button to turn on the device and lift the jockey wheel off the ground completely so that the hitch weight rests fully on the towball. Read the weight on the scale. That simple! Note that the TLC must be removed before towing. This version is for single-axle caravans or trailers; there is also a twin axle version which automatically takes into account the different load distribution involved. Find it in the list of alternative products in the yellow panel at the bottom of this product page. Since campervanstuff.com has begun to have a presence at UK motorhome shows we have purchased a box trailer to help transport our products to the shows. On our first foray with the trailer I was getting deeply worried that we might be overloading it in total weight and that our rough attempts to distribute the weight as the loading proceeded would result in an unacceptable noseweight. Not having any prior experience to go on I would not have been willing to risk setting off in our motorhome towing a trailer which was a complete unknown in terms of the safey and legality of its loading. Reich to the rescue: out came the CWC - Reich Caravan Weight Control (another of our Great Stuff products) - which we use to weigh our motorhome; using its caravan / trailer programme I was able to quickly establish that the loading was not only well within the overall limits for the trailer but also that the loading was (amazingly) just about perfectly balanced and the nose weight was about ideal. Despite being pressed for time I decided that this was also a perfect opportunity to try a Reich TLC noseweight gauge, to compare readings and ease of use. Readings were very close and the TLC was impressively quick and easy to use, not requiring any attention to the height of the trailer hitch; after the weigh its compactness meant it was easy to stow so that it would be available for a weigh on the return journey. Whilst the TLC does not have the ability to do a full weigh this was not needed for the return journey since the overall weight would not have increased (err, hopefully we would be selling products, not buying them ...) so when the time came the return noseweight was checked - in rapid time - using the TLC. Both products are great safety aids - and also great stress relievers because you can set off with confidence rather than with crossed fingers.